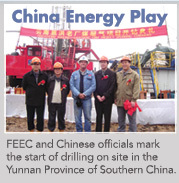 In October 2003, FEEC began drilling its first gas well on the Enhong-Laochang coalbed methane (CBM) blocks in the Yunnan Province of southern China. The Yunnan Provincial Coal Geology Bureau (YNCGB) estimates the 264,863 acres (1,072.32 sq km) covered by the Far East Energy Production Sharing Contract (PSC) contain 5.3 trillion cubic feet (Tcf) of total gas-in-place, which would be world-class. This is based on data gathered from 1,561 coal exploration drill holes and more than 30 technical reports by this bureau and other geological teams over the past 30 years. 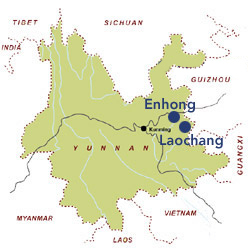 The Far East Energy Enhong-Laochang PSC covers relationship in which Far East Energy has a 60% working interest, with the remaining 40% owned by China United Coalbed Methane Corporation, Ltd. (CUCBM), a corporation given exclusive authority by the State Council of China to enter into joint venture agreements with foreign enterprises to develop CBM in China. In addition to the two production sharing contracts with CUCBM, on March 19, 2003, we entered into a Memorandum of Understanding (“MOU”) with a ConocoPhillips subsidiary, Phillips China Inc., which sets forth the terms and conditions of an agreement for our acquisition of a net undivided forty percent (40%) of Phillips’ seventy percent (70%) interest in both the Shouyang PSC (near Taiyuan City) and the Qinnan PSC (near Jincheng and Qinshui). On July 17, 2003, we signed two Farmout Agreements with Phillips on the Qinnan and Shouyang CBM blocks in Shanxi Province, P.R.C. and also signed an Assignment Agreement on the two blocks. These agreements formalized our acquisition of an undivided forty percent (40%) working interest from Phillips’ (70%) interest, with CUCBM retaining the remaining thirty percent (30%). The Assignment Agreement and appropriate amendments to the PSCs, substituting Far East Energy for Phillips China as the principal party and Operator was approved by CUCBM on March 15, 2004 and final ratification was received from the PRC’s Ministry of Commerce on March 22, 2004. The Farmout Agreements require that we fracture, stimulate and production test one exploration well that was drilled by Phillips China, and pay 100% of the cost for this test. Upon the completion of the fracing and testing, we have elected to extend into the second phase of exploration with the commitment to drill two horizontal wells in the Shouyang block with a targeted 4,000 meters in coal seams per well. In the event we decide to extend into the second phase, we will be responsible for 100% of the costs of exploration and the drilling of the phase two horizontal well. In the event we successfully complete the second phase, Phillips China will have the option to elect to either retain its net undivided thirty percent (30%) participating interest, or take a five percent (5%) overriding royalty interest (“ORRI”) on the contractor’s overall Participating Interest share under the PSCs. The ORRI will be capped at five percent (5%) of the current contractor’s seventy percent (70%) Participating Interest, or a three and a half percent (3.5%) ORRI on a one hundred percent (100%) interest basis. After the second phase, CUCBM will also have the option to elect to participate as a working interest partner for anywhere from a net undivided participating interest of zero to thirty percent (30%). We will later recover the other working interest participants’ share of our exploration costs if they elect to participate after the successful completion of Phase Two. 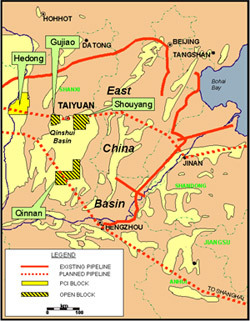 Based on estimates by ConocoPhillips and Yunnan Provincial Coal Geology Bureau the project areas potentially contain 18.3 Tcf to 24.9 Tcf of total gas-in-place. Using an internal estimated recovery rate of 50%, recoverable CBM resources are potentially 9.2 Tcf to 12.5 Tcf (FEEC’s share is 4.8 Tcf to 6.9 Tcf depending upon CUCBM and ConocoPhillips participation). • 5.3 trillion cu. ft. of total gas-in-place with potentially 2.65 tcf of recoverable CBM resources. Far East Energy could potentially place hundreds of horizontal wells on each of the two blocks. Tests show the amount of gas per ton of coal is 200 to 500 cu. 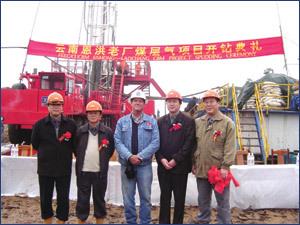 The Shanxi project in full development could sustain an estimated 3000 horizontal gas wells. It could be one of the largest CBM projects in the world. Far East could be a 66.5% owner of this project if ConocoPhillips decides to participate on an overriding royalty basis. Alternatively Far East would retain a 40% interest if ConocoPhilips elects to participate but would only have to put up 40% of the development costs. The core recovery tests by ConocoPhillips indicate huge levels of cleating (a very good sign) and friability (brittle and fragmented coal) suggesting high permeability and the tests also show good gas content.